Home News Archive The Greatest Celebration of All! A short time earlier Christ had risen Lazarus from the dead, thereby gaining the respect and faith of the people, but also the hatred of the fanatics. The Church names this day the "Saturday of Lazarus" in remembrance of the resurrection of Lazarus and its promise of universal resurrection for all men. The Church connects this celebration, by anticipation, with the Entrance of Christ into Jerusalem: "We carry the Symbols of victory and cry Hosanna in the highest". Palm Sunday celebrates the glorious and brilliant feast of the Entrance of Jesus into Jerusalem. Zechariah had prophesied the entrance of the Messiah into Jerusalem. Monday of Holy Week commemorates the blessed and noble Joseph and the fig tree which was cursed and withered by the Lord. The withering of the fig tree was a miracle of special symbolism, since the tree had leaves, but no fruit. It is symbolic of the many people who claim ethical and religious identity, but who in reality have empty lives that yield no fruit. Tuesday of Holy Week (sung by anticipation now Monday evening) commemorates the parable of the Ten Virgins, preparation and wakefulness are the foundations of vivid faith. On Wednesday of Holy Week it has been ordained by the Holy Fathers of the Church that commemoration should be made of the anointing of Christ with myrrh by the woman in the house of Simon, the leper, in Bethany. Repentance was the mission of the prophets. Thursday of the Holy Week. Jesus drew His last breath of freedom on this Thursday night. Christ knew all the incidents which were about to take place, and called to Him His Apostles in order to institute the Holy Eucharist for them and for the Church forever. At the end of March, with the full moon as a brilliant lantern in the sky and the weather, mild, the people, in Jerusalem enjoyed the beginning of spring. In this, atmosphere, Christ presented Bread and Wine as the Elements of His Very Body and His Very Blood; they are the Precious Gifts which have been left as His perpetual Presence in the Church. The institution of the Holy Eucharist and its re-enactment through the centuries, both as a sacrifice and sacred ceremony (Mysterion), is the life giving remembrance which, along with the Crucifixion and Resurrection of Christ, constitutes the basis of salvation for the Christian. Then followed the incidents of dramatic closing moments of Christ's life. After the washing of His Apostles' feet, He pointed out the betrayer, inaugurated the Eucharist, and pronounced the new commandment of love for one another. He spoke to them words of comfort, promising the descent of the Holy Spirit to complete man's union with Christ. His departure, Christ said, would bring to them and the world joy. Christ took His Apostles out in the mild night where He could see face-to-face His co-workers in the bright light of the full moon. In this spiritual mood and physical setting, Jesus withdrew to pray. After this agony of the "bloody sweat" came the kiss of Judas and His arrest. He thus became the source of spiritual and physical freedom for mankind. Good Friday celebrates the Holy, saving and awesome Passion of Christ. To take away our sins, Christ willingly endured the spittings, scourgings, buffetings, scorn, mocking and the purple robe; the reed, sponge, vinegar, nails, spear and, above all, the Cross and Death. 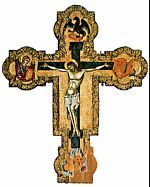 The confession from the cross of the penitent thief, crucified with Christ, is celebrated. This service is long, but its content is dramatic and deeply moving for the devout Christian. Participation in the prayers and the historical sequence of the events, as related in the Gospels and hymns, provides a vivid foundation for the great events yet to come. Psalms are read and Resurrection hymns are sung which tell of Christ's descent into Hades. "Today Hades cried out groaning" is the hymn's description of the resurrection of Adam and the conquering of death. Thus this day's celebration is called "First Resurrection". On Easter Sunday (Saturday midnight) the life-giving Resurrection of our Lord and Savior Jesus Christ is celebrated. Before midnight, the Odes of Lamentation of the previous day are repeated. The Orthros of the Resurrection begins in complete darkness. The priest takes light from the vigil light and gives it to the faithful, who are holding candles. The priest sings: "Come ye and receive light from the unwaning life, and. glorify Christ, who arose from the dead", and all the people join him in singing this hymn again and again. From this moment, every Christian holds the Easter candle as a symbol of his vivid, deep faith in the Resurrection of Jesus Christ as Saviour. In many churches the priest leads the people outside the church, where he reads the Gospel which refers to the Angels statement: "He is Risen; He is not here". Then comes the breathless moment as the people wait for the priest to start the hymn of Resurrection, which they join him in singing, repeatedly: "Christ has Risen from the dead, by death trampling upon Death, and has bestowed life upon those in the tombs".